For the first time in 17 years, AEK wins the Greek Cup title. 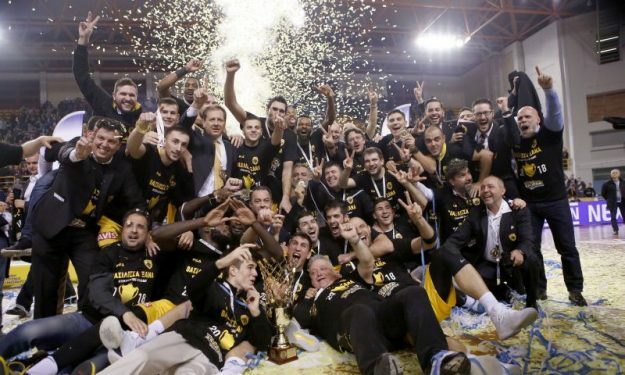 After eliminating Panathinaikos in the Greek Cup semifinal, AEK BC achieved nothing less than an enormous triumph by defeating EuroLeague powerhouse Olympiacos 88 – 83 in the final and winning the title for the first time since 2001. This is AEK’s fourth domestic Cup title and 14th major title overall in the history of the franchise. Furthermore, they became the first Greek team not named Panathinaikos or Olympiacos to celebrate a title since 2004 when Aris BC had also won the Cup with a victory over the Reds. Manny Harris won MVP honors after scoring a team-high 17 points and grabbing 4 rebounds. He was also the one to put his team in a major pole position in crunch time thanks to the basket that made 86 – 82 with 15 seconds remaining. Janis Strelnieks then won a foul in the next play but made 1/2 of his free throws. On the other end, Delroy James sealed his team’s victory with 2/2. Olympiacos was trailing for the vast majority of the game despite the efforts of a superb Vassilis Spanoulis (20 points season-high/9 assists) plus Nikola Milutinov (17 points, 7 rebounds). AEK were up 45 42 at halftime thanks to making the most out of their many uncontested mid and long-range shots. Olympiacos took the lead 61 – 60 near the end of the third period but failed to preserve it and their opponents managed to always remain one step ahead until the final buzzer. Coach Dragan Sakota also found many bits of help by Vince Hunter (14 points) and Kevin Punter who also made an impact with 14 points despite being with AEK for only one week.